You have students who are very high achiever and they would like to enter the science fair? 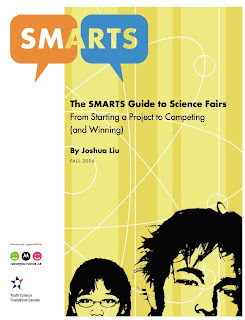 The Smarts Guide to Science Fairs is a document that is aimed at advanced students who are willing to compete at science fair at a high level. It doesn't seem to be designed for elementary students or for beginners. It's produced by the Youth Science Foundation, which organize the Canada-Wide Science Fair. Even is some of the information related specifically to science fairs in Canada, most of the tips presented can be useful to anyone entering a science fair. It is presented as a list of 20 steps from choosing a topic to participating in the international science fair. It also includes topics such as doing research, picking your project type, writing a hypothesis, experimental design, conducting the experiment, statistical & data analysis, discussion, writing a conclusion and writing a report.